The Phantoms enter the final game of their four-straight at home facing their toughest challenges of the 2018-19 season. On the surface, things may seem fine: They remain in fourth place on points, and second place in win percentage in the AHL Atlantic. However, they’re 6-4 in their last 10 as they regress back towards .500, and are but 1-2 thus far on this stretch at home. The lineup is in a complete upheaval due to injuries, call-ups, and a suspension. But adversity breeds opportunity, and the good news is that the Flyers–and with them the Phantoms–have some depth in the system which will allow them to move forward with AHL players who have an opportunity to prove they belong in the American League. Tonight is their chance to answer the Belle (ville). Center German Rubtsov has a shoulder and will miss the remainder of the season. Center Misha Vorobyev is injured, and not thought to be serious. However, he is not expected to play tonight. Forward David Kaše missed Saturday with an injury, and is now also suspended for tonight and tomorrow for a head blow he delivered to an unsuspecting Bear on Friday night. Forward Cole Bardreau was unable to practice all week due to an undisclosed injury. He is not expected to play this evening. Center, leading scorer, and reigning AHL MVP Phil Varone has been promoted to the Flyers on merit. Goalie Alex Lyon has been promoted to the Flyers to back up Anthony Stolarz as Brian Elliott continues to recover from injurie(s), and Michal Neuvirth attends to his growing family. Goalie Brandon Komm is in town from Reading, to back up Carter Hart. Center Mike Huntebrinker was called up to the Phantoms earlier this week to help fill the need for centermen. He’s on an AHL contract, but this will be his first regular season appearance at this level. He’s been on fire for the Royals so far this season and has earned this opportunity. Forward Alex Krushelnyski is up from Reading as well, to help with the attackers. 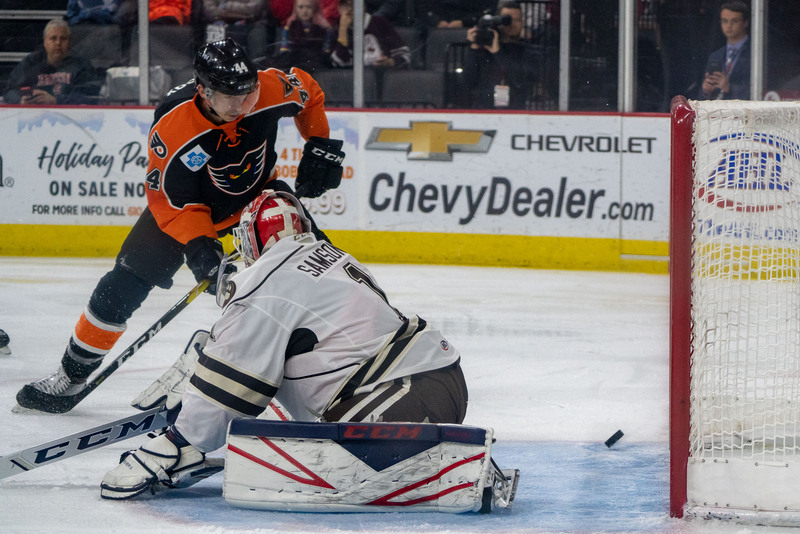 Lehigh Valley Phantoms goaltender Carter Hart secured the first shutout of his professional career this past Friday night against the Hershey Bears, turning aside all 26 shots he faced during the contest. Over his WHL career, Hart recorded a total of 26 shutouts which is tied for the record for most shutouts by a goalie in the WHL. Lehigh Valley captain Colin McDonald played in his 800th professional game on Wednesday night against the Cleveland Monsters. In his now 12-year career, the Wethersfield, Connecticut, native has amassed 179 goals and 215 assists for a combined 394 total points. Over his past three starts – against Hershey, Toronto and Laval – Lehigh Valley Phantoms goaltender Carter Hart carries a 3-0-0 record with a 1.34 goals-against average and .955 save percentage. It’s “Youth Winter Hat Night” so bring the kiddos and use a main entrance to get the free toque. The Belleville Senators are in town to face off against the Hamilton Street Heroes. They’re currently in sixth place (pct) in the AHL North. Names you might recognize with the Sens: #28 F Paul Carey, #27 D Stefan Elliott, #20 Tobias Lindberg, #18 F Boston Leier. Rookie prospect goalie #30 Filip Gustavsson will likely be backing up goalie #35 Mike Condon or veteran #1 Marcus Hogberg tonight on turn. The Phantoms defeated Belleville 4-2 two weeks ago in Canada. 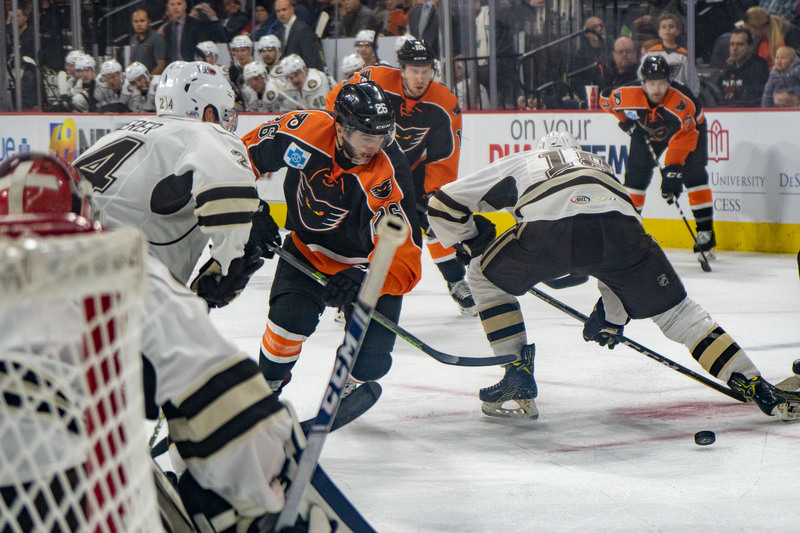 The Senators claimed a 2-0 lead before the Phantoms clawed back behind goals from Chris Conner and Mike Vecchione. Connor then had the game-winner on a final-minute penalty shot before Taylor Leier added an empty net tally. Tyrell Goulbourne had an epic fight in the contest, versus #3 D Jonathan Racine. It’s Carter Hart’s net, and we’re all just watching. No question in goal tonight, in my mind. How will Carter respond? More media reports this week about how he’s comfortable now, and ready for the NHL. His last three games have been outstanding. One of the things for players at this level is consistency–and that goes double for goalies. Watch to see if he can keep his strong play going. There’s unrest in Philly and crazy things could happen. The ‘new guys.’ It’s all hands on deck tonight, let’s see how the red-hot Huntebrinker looks. Krushelnyski has played well for us before. Other guys in the lineup need to start contributing. Huntebrinker will wear #27 and Krusher #36. Another note on Hunty: He’s been with the team all week and has had the chance to practice with them. He should be ready. Goulbourne v Racine II: I don’t like predicting fights–and I couldn’t find a nice copy of this one to embed–but the way Racine was beat in that last bout leads me to believe he’d like another crack at T-Gillz. Keep your eye on Sens #3. If they do throw down, look for the Tyrell signature finishing move: Switch to the southpaw and drop him with the over-hand left. Blue line: Keep an eye on the defencemen tonight as the attacking lines might need some time to gel. They’ll need to support Carter Hart and keep this game close if the goals don’t come right away. I’m not sure going down 0-2 early is going to be an effective strategy tonight. Special Teams: The PP and PK had been super. However, the shine started to come off a bit as they returned home from Canada last week, and with the upheaval in the roster, weaknesses could be exposed. Keep an eye on how they do, and why. The Phantoms have also been one of the least-penalized teams. Watch to see if that can continue with the changes in the lineup–guys trying too hard may be prone to taking unnecessary penalties. Lines: Take a look at the lines, top to bottom, to see where they slot guys in. Hunty is interesting because you’d normally expect a guy up from Reading to be on a lower line–but he’s a scorer so perhaps he’ll be up top with Carey and NAK? He’s had all week to get acclimated, after all. Even with a strong game tonight against the middling Senators, the job doesn’t get easier and the new-look Phantoms will get a challenge up at Casey Plaza tomorrow. The surging Penguins await the Phantoms tomorrow, while Hershey returns on Wednesday and a very strong Syracuse team comes in next Friday for two more exciting hockey games at the PPL Center! We’re at a bit of a crossroads with this team right now as the lineup changes and subsequent adversity could manifest with good or bad results on the ice. Goulbourne vs. Racine and it was even until @Tgillz12 switched to the left. My goodness, that switch to the left for Goulbourne worked well in his last AHL fight too IIRC.